It is possible to take exotic trips with young kids. Zeke still talks about our “big trip,” even mentions Cambodia and Vietnam by name. Having a baby changes everyone. One of the biggest adjustments for me was putting away my passport. I went from visiting three continents in my first six months of pregnancy to managing nothing more exotic than Cabo San Lucas during the first four years of my son’s life—and all-inclusives certainly weren’t going to scratch my travel itch. That’s when I called Andrea Ross, our Trusted Travel Expert for Southeast Asia. She’d raised her kids in Cambodia and traveled with them all over the region. I asked her: Could I have the sort of enriching trip that I longed for—but one that my four-year-old son would also enjoy, not just suffer through? Not only did she assure me that it was possible, Andrea told me she’d plan it, crafting a two-week itinerary that got us to Angkor Wat and Siem Reap, in Cambodia, plus Hanoi, Halong Bay, Hoi An, and Saigon in Vietnam. 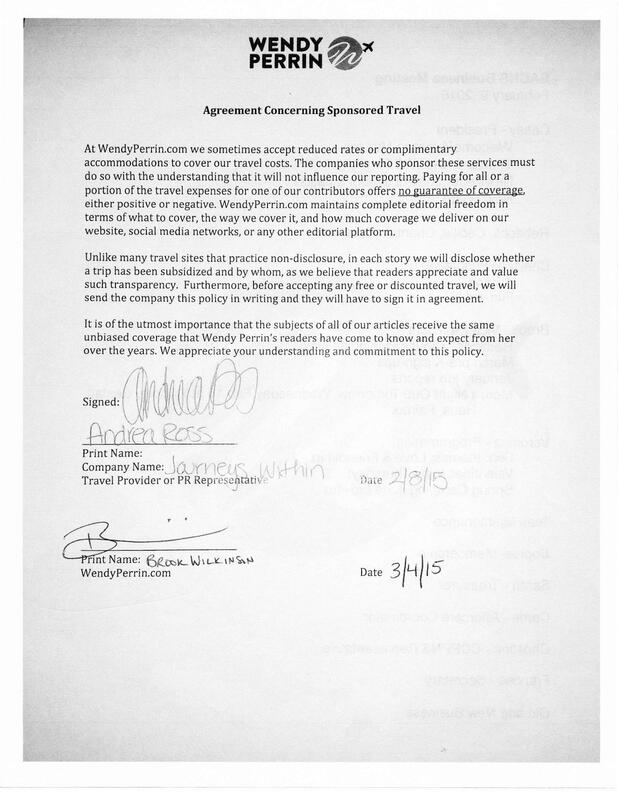 Book with a Trusted Travel Expert. I’ve done plenty of independent travel. But leaving the planning to Andrea this time meant that I could focus on my family rather than rustling up that night’s hotel confirmation or figuring out how to get from A to B. And having done it all with kids herself, Andrea could anticipate our needs, choosing hotels with truly useful perks (free laundry at Siem Reap’s Unique Boutique), kid-friendly guides, and cultural experiences that we never could have booked on our own, such as meeting a Vietnamese family who played their collection of traditional instruments for us—and then invited our son, Zeke, to bang away on them to his heart’s content. Build anticipation. Andrea advised us to look at maps with Zeke, borrow books about Southeast Asia from the library, and discuss the itinerary with him. This also helped prep Zeke for the most unfamiliar moments of the trip: While he was initially reluctant to sleep on a boat in Halong Bay, I talked him into it by showing him photos of our junk online, and explaining that he’d be the only kid in his class to have spent a night on a boat. By the time we got there, he was thrilled to hop aboard. Don’t look to your bucket list for inspiration. Since you probably won’t get to every place worth visiting (see Rule of Four, below), this isn’t the time to fulfill that lifelong dream of seeing Machu Picchu or experiencing the Australian Outback. It is, in fact, a great time to revisit a place that you already love. I’d been to Siem Reap eight years earlier—even stayed at the same hotel—and so everything felt familiar. This made it easier for me to get around with a kid, and to accept that I’d be spending my afternoons at the pool rather than poking around town. Follow the Rule of Four (or more). At least four nights in each location, that is. Andrea set a quick pace so that we could see all the major highlights of Vietnam; the downside was that we had to spend only one or two nights in several locations in order to squeeze it all in. If I had it to do over again, I’d stick to just two or three destinations and stay in each longer. After our fourth night in Siem Reap, Zeke was finally getting comfortable with our surroundings and the hotel staff—just in time for us to move on. Help your child create a “Things that Are Different” or “New Things I Tried” book. This brilliant advice came from Andrea, who devised it as a way to turn potential negatives into positives, and to engage kids in really seeing what’s around them. 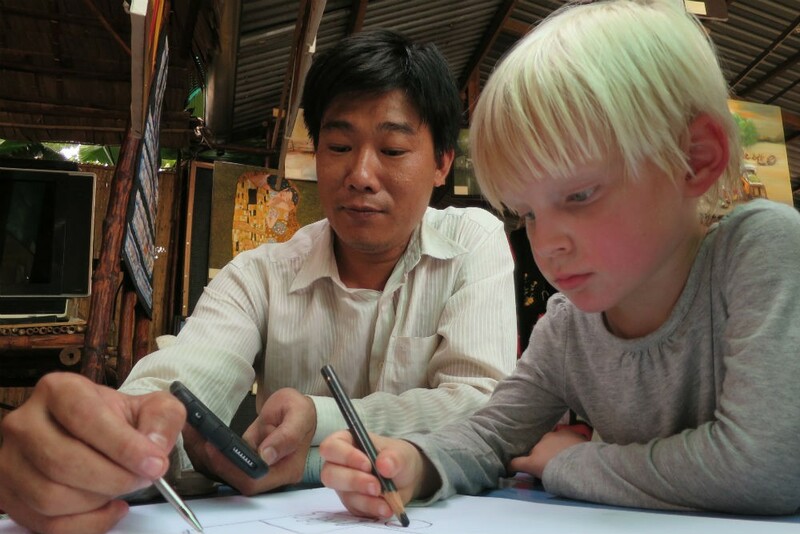 Before we left, Zeke helped pick out a blank Moleskine notebook; during the trip, he drew tuk-tuks and trees on its pages, and dictated stories about houses on stilts and shops without doors. I left pages blank so that I could add photos from each day, and I plan to use the same notebook on our next trip—thus creating a journal of Zeke’s early travels. Don’t focus on the flights. 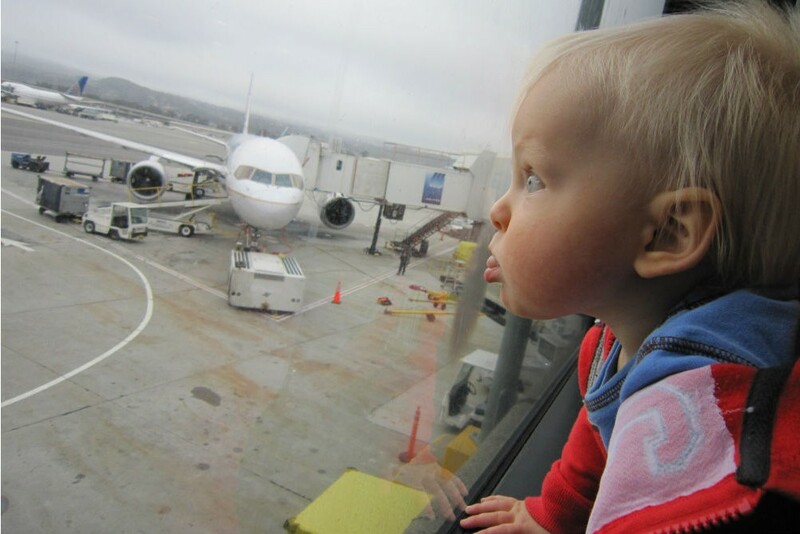 Long-haul flights are to family travel what diapers are to early parenthood—the thing that feels like it’s going to be a huge deal, but really isn’t. Stay tuned for an upcoming article with my tips on making the best of a long flight with a young kid; in the meantime, rest assured that however distant your destination, the flying time is a small fraction of your overall trip (I say this even after spending almost 38 hours in the air over the course of our two-week trip). Don’t skimp on toys. Andrea cautioned me not to pack light with a kid in tow. How I wish I’d taken her advice and brought more to keep Zeke occupied during our downtime. Next trip, I’ll pack a new small toy for each day, which I can bring out for that moment when Zeke doesn’t want to walk through another museum, or when I simply need a rest. Balloons are also great: They’re small and light for packing, and a quick distraction when blown up. Prioritize doing, not seeing. Interaction is key to a kid’s enjoyment of the trip. Anything we did that allowed Zeke to participate was a hit. 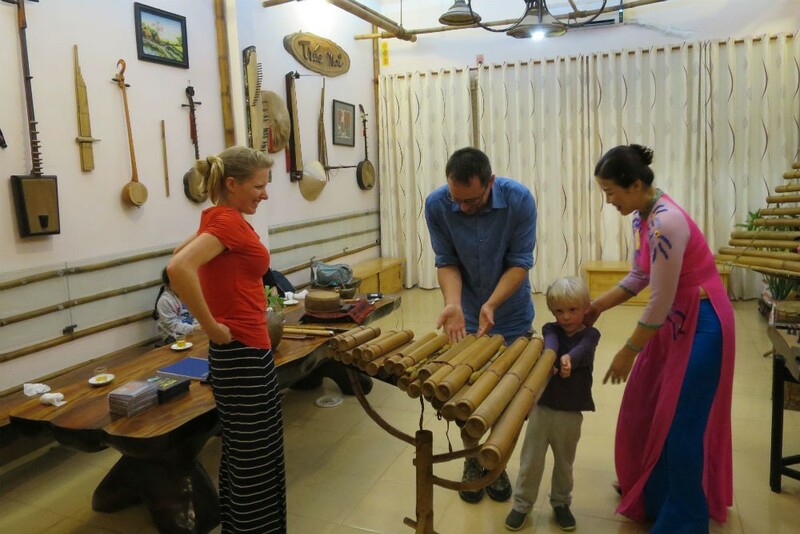 The highlight of the trip was the day we spent in the Mekong Delta, during which Zeke got to help cook puffed rice, make rice paper for spring rolls, and sketch a truck with a local artist. Andrea warned me that the experiences she had planned for us there were a bit more touristy than the biking or walking tours she arranges for adults—but taking part in all the local industries was right up Zeke’s alley. 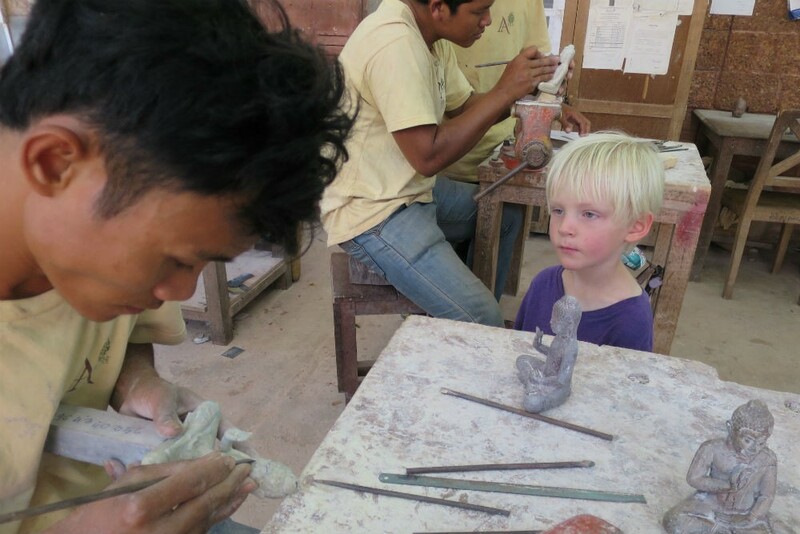 Another highlight for him was the Artisans d’Angkor silk farm and workshops in Siem Reap, where he got to finger spider-web-fine threads of silk and take a crack at carving soapstone. When Zeke got bored wandering around yet another ancient temple, simply handing him our camera to take photos bought us another half-hour of happiness. Plan at least one thing each day for the kids. Use that activity as a motivator to get through the rest. 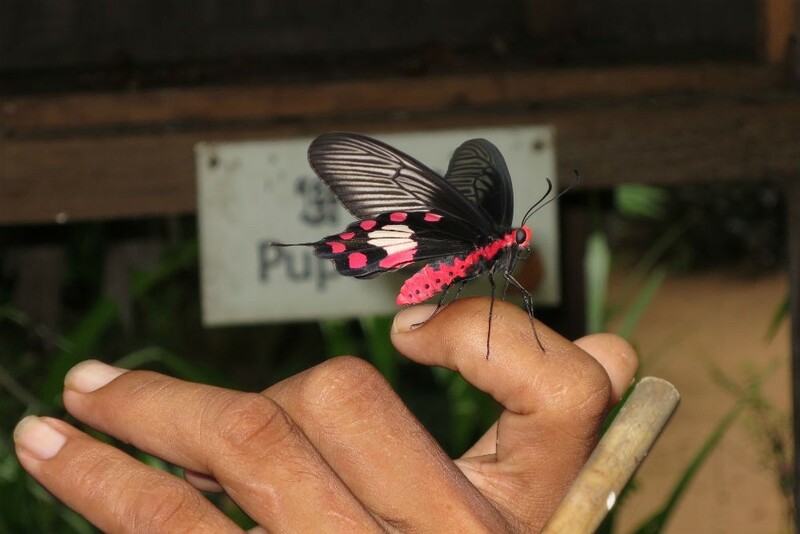 When Andrea wanted us to see several smaller, less crowded temples outside the Angkor Wat complex, she sweetened the day for Zeke by adding a stop at the fabulous Banteay Srey Butterfly Centre. Schedule downtime. Even kids who don’t nap at home will need to rest each afternoon, given the added stimulation of a foreign country. On the days that we failed to make this happen, we paid the price with an extra-cranky kid. Andrea also wisely planned two days at the Hoi An Beach Resort in the middle of our trip, which were essential for all of us to recharge. A bag of sand toys bought from a roadside stand for Zeke, umbrella drinks for my husband and me, and we were once again a happy family. Gather playground intel. In cities, where your hotel room is bound to be small, you’ll need somewhere to burn off energy. 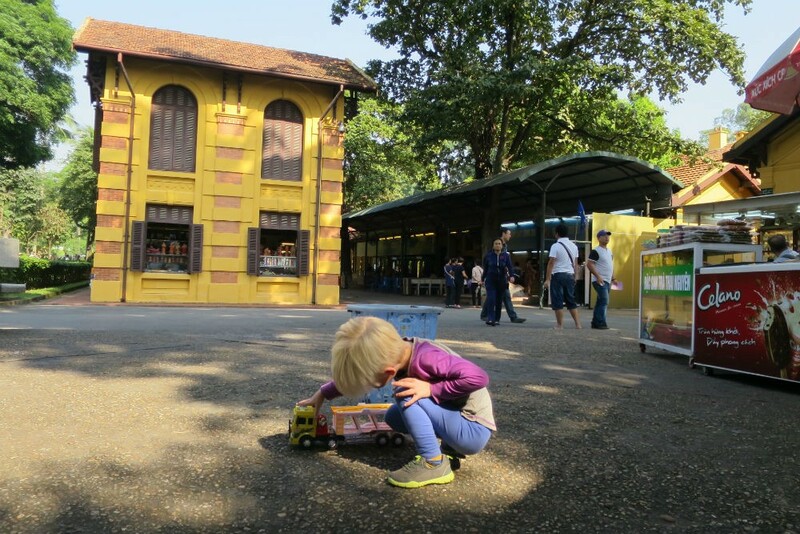 Public spaces dedicated to kids are largely a luxury of the developed world; in Hanoi, when Zeke voiced his displeasure with the city tour we had planned, our guide brought us to Tini World, a play area inside a high-rise mall. Sure, we missed Ho Chi Minh’s Mausoleum and the Fine Arts Museum, but we still got to chat about contemporary Vietnamese culture with our guide while Zeke played in the ball pit and painted a ceramic crocodile. Employ a private driver. The money you’ll spend is well worth it. 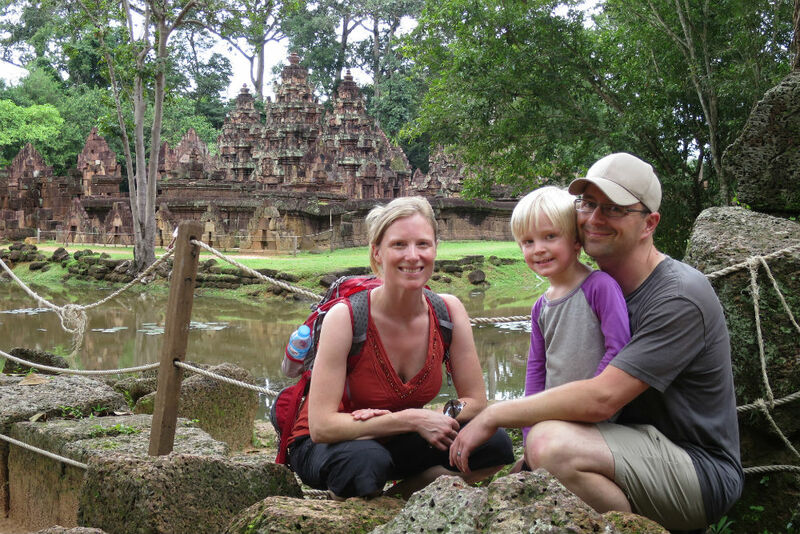 We could have hired a tuk-tuk to drive us around steamy Angkor Wat—but taking breaks inside our air-conditioned van, with cold towels and icy drinks at the ready, kept Zeke’s energy from flagging and meant that we were able to do more touring. It also allowed us to leave a bag in the vehicle with spare clothes, water, toys, and other in-a-pinch supplies, carrying in my backpack only the essentials (which for us included sunscreen, tissues, and tangerine-scented hand sanitizer—which Zeke would sniff as we strolled through pungent Asian markets). Don’t push unfamiliar food. So much about being in a foreign country is overwhelming to kids; let them find some comfort in their meals. English menus with a “western food” section? It’s the last thing I’d want in a restaurant when traveling alone, but my first priority with a kid. Be proactive about keeping blood sugar high—if ever there was a time for unlimited quantities of whatever you limit at home (in our case, bread and ice cream), this is it. Manage your expectations. I went into the trip imagining that Zeke would emerge from his bubble of relative plenty and discover how much less most other kids make do with; instead, Zeke focused on his own deprivations. Let me tell you, it’s humbling to have your kid whine for sparkling water and insist on being carried when you’re surrounded by children whose parents have sent them onto the streets to sell postcards and trinkets for a living. Bend your parenting rules. Travel with young kids is hard. Cut yourself some slack, whether this means offering unlimited screen time or resorting to bribery. (Zeke often ended up on our shoulders midway through a temple visit. With the promise of a single packet of M&Ms, I got him to walk on his own through all of Banteay Srey.) Don’t worry about setting a bad precedent; children understand that things will go back to normal once you’re home. Splurge at the end. Through most of our trip, my husband, son, and I were fine with sharing a single room. Early on, it would have been a waste to have a suite, as jet lag was waking Zeke up at night. But by the end of the trip, my husband and I were starved enough for adult time that we tried to sneak out after putting Zeke to bed (a Skype call from laptop to smartphone serving as our baby monitor)—only to find that our hotel’s bar had been taken over by a cruise-ship group for a loud performance. As we gulped down our drinks on our room’s cramped balcony, I vowed to end our next trip in a suite. Keep your eyes on the prize. 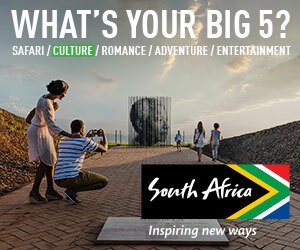 If your main goal is to relax, this isn’t the right kind of trip for your family. But if you want to foster a love of travel in your kids, and a curiosity about the world and all its differences, it’s best to start young. I had to remind myself many times that the goal of our project was to expose Zeke to new things—which doesn’t have to be enjoyable to be worth it. Zeke still talks about our “big trip,” even mentions Cambodia and Vietnam by name. They’re now his touchstone for a part of the world where things are different. And that, to me, is worth everything. 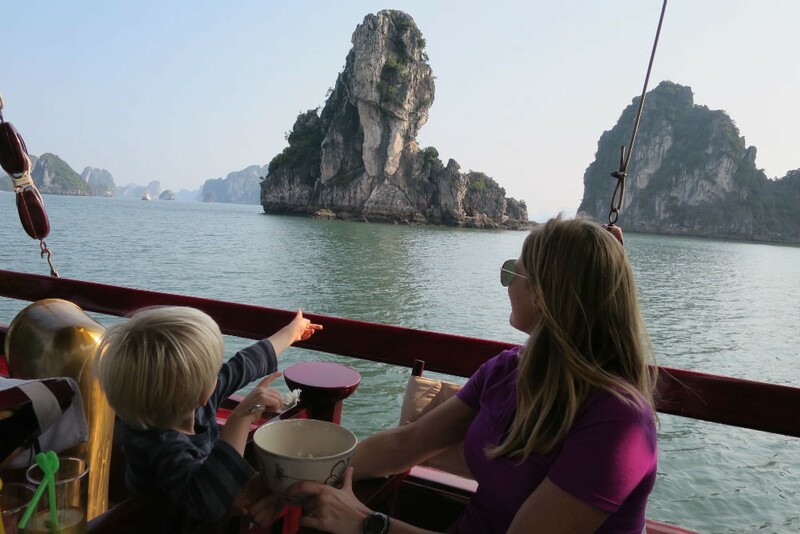 What lessons learned have you learned from traveling to exotic places with young kids? Share your own tips below. Air-tested tips for surviving a flight with young kids.